Today marks 1-year since I was initiated into the Commemorative Order of St. Thomas of Acon. The meet was quick with an exemplification of the ritual and I was asked to be Secretary for my Chapel. I look forward to this experience as this is my first Secretary position within a Masonic organization. The history of this order is named after Thomas a Becket who was assassinated at the order of King Henry II and was a knighthood started in the crusades. Today order is headquartered out of England with provincial bodies around the world, the largest being the US. Knights wear a mantle and tunic, both of whom are white, with a red cross superimposed by a white cross, and ornamented with an escallop shell. For those knights who have performed the pilgrimage to the Canterbury Cathedral, a knight is entitled to wear the Badge of a Pilgrim on the right shoulder of the mantle. 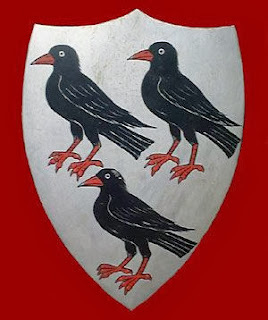 The Badge of a Pilgrim is three coughs upon a shield, two and one; the Choughs are black with red feet and beaks. The Chough makes an appearance in Greek mythology as well as Arthurian mythology. In the Grecian mythology, the Chough is known as the "sea-crow" and was considered sacred by the Titan Cronus and was said to be an inhabitant of Calypso's Blessed Island. In Cornish legend, King Arthur did not die after his last battle, but transformed into a Red-billed Chough. The legs and beak were red in memory of the last battle and, for which reason, killing a Chough was considered extremely unlucky.